Home → Basement Pump Battery Backup System → What’s Up? The Water Levels in Your Basement Could Be, Unless You Do One Thing. What’s Up? The Water Levels in Your Basement Could Be, Unless You Do One Thing. If your basement requires a sump pump to help it stay dry and usable, then you know how important it is that it functions properly. But imagine this scenario – heavy rains and winds, thunder and lightening, and a power outage. This is the perfect storm for basement flooding. But you have your reliable sump pump, so no worries, right? Well, if the power goes out, you’re out of luck. How can you guarantee your sump pump will work even during an outage? 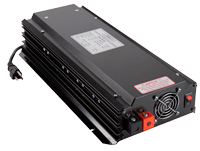 By choosing an SEC battery backup system. This battery backup system offers an AC to DC power inverter, which allows you to use the same 3000-gallon per hour pump that you rely on to keep your basement dampness-free. The circuitry is reliable, offering the proper pump placement and gallons-per-hour required by most homes during a loss of power. You can depend on the SEC sump pump battery backup system to keep your basement – and all the important items in it – protected during an outage. And, SEC offers backup systems for both one-third and one-half horsepower sump pumps. And, the SEC battery backup offers many advantages, including instant automatic power transfer as well as silent and clean operation. It supports full pump capacity, and has a 10-year life expectancy, so you can count on your battery backup lasting for years to come. And, when you trust the experts at Basement Waterproofing, Inc. to help, we’ll make sure your SEC battery backup system is installed professionally so you can rely on it no matter what happens. When you need a basement pump battery backup, let BWI talk to you about our SEC basement backup for your sump pump. For your convenience, we’re fully staffed during normal working hours to answer your calls – call us at 800-439-4951, and we’ll be glad to help.